BRAUN - Hierosolymia, Clarissima totius Orientis civitas. BRAUN,G. / HOGENBERG, F. - Hierosolymia, Clarissima totius Orientis civitas. Hierosolymia, Clarissima totius Orientis civitas. - BRAUN,G. / HOGENBERG, F.
Title : Hierosolymia, Clarissima totius Orientis civitas.. Size : 13.8 x 20.4 inches. / 35.0 x 51.9 cm. Description :Two bird's eye perspectives town-plans on one sheet. The left plan shows ancient Jerusalem at the time of Christ. A contemporary view of Jerusalem appears to the right with an attractive vignette lower right of Moses receiving the Tablets. From the greatest publication in this genre !. The Civitates was compiled and written by George Braun, Canon of Cologne Cathedral. 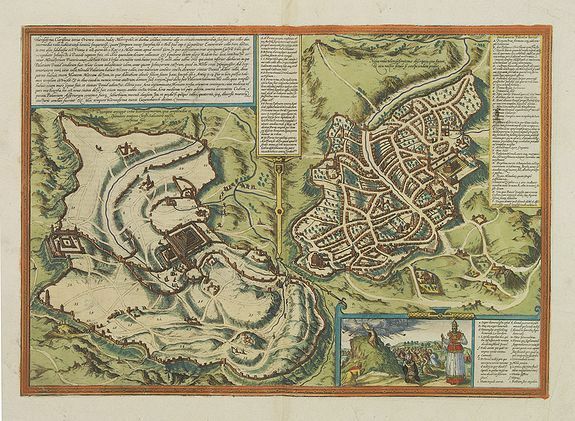 Braun gathered together vast amounts of information and draft plans to produce over 500 city views/maps published in six parts between 1572 and 1617. Most of these engravings were made by Simon Novellanus and Frans Hogenberg, many after drawings by Joris Hoefnagel. Condition : Paper slightly browned. Good impression. Good condition.